Anonymous. 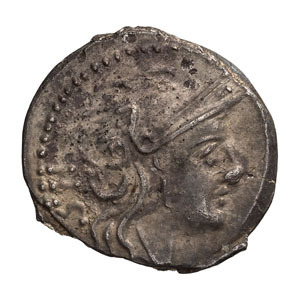 Sestertius, 1.08gg. (4h). Apulia, From 211 BC. Obv: Helmeted head of Roma right, value mark II behind. Rx: Dioscuri galloping right holding spears, each with star above head, ROMA in relief in linear frame below. Crawford 44/7. VF+. 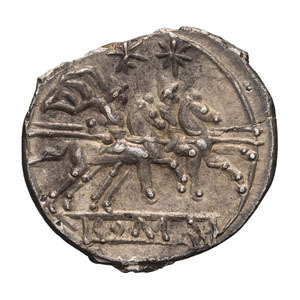 Although the initial issue of the denarius and its fractions are assigned by Crawford to the mint of Rome, recent studies suggest that the denarius was in fact first struck in Apulia.